Here you will find a number of downloads and goodies to help you grow your business and sales – no strings attached, just free! 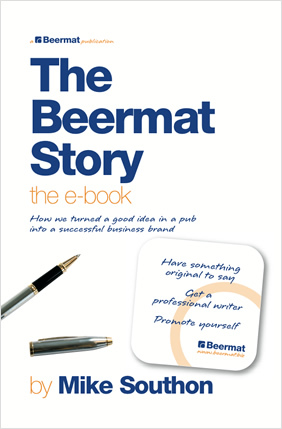 Here is the Beermat story! The free e-book outlines our story with all of its highs and lows. Want to write a bestseller? Want to build a speaking career? See how it was done here. Learn how to get the most from networking events. This guide explains how to make new contacts and generate sales leads at events. It also offers a structured approach to starting up conversations. Perfect for people new to networking and who are a little nervous. Also suitable for experienced networkers, looking to develop old networking skills. Emails are not intrusive, as the phone is, and have a good chance of getting read, unless they are spam or personal but verbose. 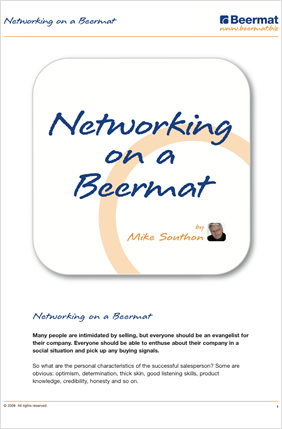 A ‘Beermat’ introductory email is compelling, brief and personal (every email will be slightly different, written individually and sent to a specific person). The aim of the email is to get you that first 15 minute meeting with a potential client. 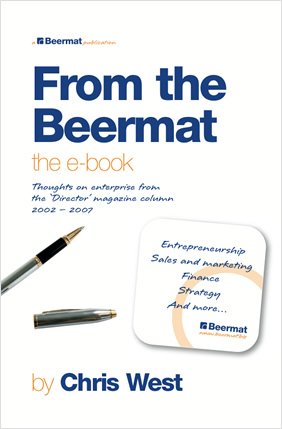 From Sales on a Beermat, published by Random House, August 2005 © Mike Southon and Chris West 2005. Here, for the first time, are over forty pieces from Chris West’s much-praised column in ‘Director’ magazine. Clear, original and funny, these pieces cover all aspects of starting and building a business. Want to be inspired by Thomas Alva Edison, hear about The Legend of the Lone Entrepreneur, or understand why most business plans fail by aiming at the wrong audience? This e-book is for you. 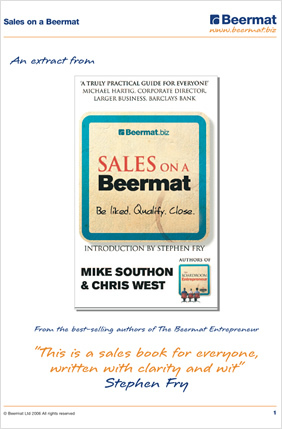 In Chapter 9 of our book “Sales on a Beermat” we talk about the Beermat Sales Pipeline. This spreadsheet is a simple working version of the Pipeline for people who are new to spreadsheets, and are not used to working with Excel, to use as a starting point. It will help you to manage sales and also accurately predict your cashflow. This is intended to help people who are new to using Excel and not more advanced users.